SEOUL/GOSEONG, Gangwon Province -- A group of South Korean officials and railway experts returned home Monday after completing a 10-day inspection of the rail along North Korea's east coast, the unification ministry said. The 28-member team crossed the Military Demarcation Line in the eastern region of the peninsula at around 1:40 p.m. by bus, according to the ministry. "The conditions of the (eastern) railway appear to be almost the same as the (western) Gyeongui line," Lim Jong-il, a transportation ministry official who led the inspection team, told reporters. "(The train) ran at around 30 kph." "In particular, we focused on looking at the road beds, tracks, bridges, tunnels and the system," he added. "We think we need additional checks ... We shared the need to conduct additional in-depth inspections from early next year." The inspection is part of efforts to connect railways between the two Koreas as agreed by their leaders in April. The two Koreas jointly conducted a six-day survey of the North's western rail line from Kaesong to Sinuiju starting Nov. 30. This marked the first time that a South Korean train had run on the North's eastern Kumgang-Tumen line since the Korean Peninsula was divided after the 1950-53 Korean War. The train traveled along 2,600 kilometers of railways in the North. The North's rail system is known to be so old that it requires major repairs or replacement in order to be connected to South Korea's. 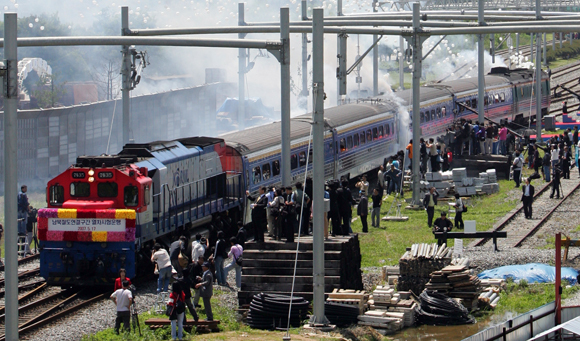 The train sent for the inspection of the western rail line ran at speeds of around 20-60 kph, Lim said earlier. The leaders of the two Koreas agreed in April to "modernize" and "connect" the roads and railways across their border as part of efforts to foster balanced development and co-prosperity on the peninsula. The two Koreas are set to hold a groundbreaking ceremony for the road and railway connection project at Panmun Station, just north of the inter-Korean border, on Dec. 26. Details of who will attend the event and how it will be organized have yet to be determined. Unification ministry spokesman Baik Tae-hyun earlier said that the Seoul government plans to send an advance team to the North this week to prepare for the upcoming joint celebration.